I bought a similar gift for my dad years ago but the personalization rubbed off. I wanted to get him another clip to replace his old one, I thought this would be a great choice. I really liked it when it came in the mail and it was everything I expected it to be. However, I did feel like it was a little pricey. It shouldn't cost as much as it did for what I got... But, otherwise I was very happy. Not a wedding gift, but I got it for my boyfriend for christmas because its a lot easier to take this than a bulky wallet out for dinner or a function, and a lot sleaker and profesional than just carrying cash and credit!! Very practical use! i got this for my husband who hates a bulky wallet... he absolutely loved it.. it provides enough to handle all of the important things a wallet can hold but without all of the bulk..
Q:How do i personalize for four people on the website? It gives me 2 boxes to write what i would like on the products but i need to customize 4 of them not 2? Q:How many credit cards will this hold? A:Approximately 6 cards, it depends upon the thickness of the cards. Q:So the leather part is a pocket to slide cards into? A:This is a money clip. The backing is leather and the clip part is metal. Nothing ruins your dapper groom's profile on your wedding day like a bulging wallet in his pocket. 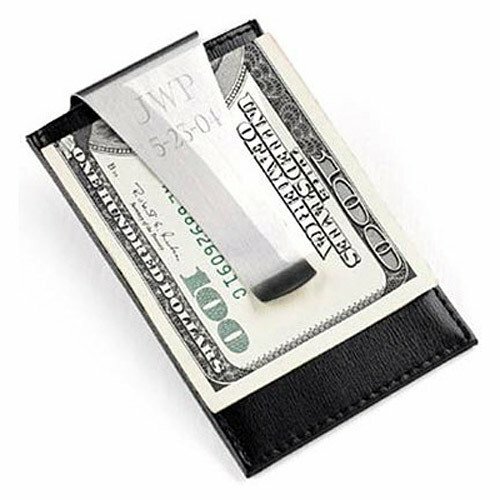 Slim him down with this ultra-thin personalized money clip and credit card holder. Also a special—albeit humorous—way to thank the father of the bride for footing the bill! Each sleek leather money clip is made of top-grain leather and features a sturdy metal money clip that can be engraved with his initials and date or a special message of your choosing (maximum of two lines with up to eight characters each). Measures 3.88" x 2.63".